If you’re looking for a super delicious, yet easy-to-make pasta dinner idea to add to your weekly recipe rotation, try this Leek and Mushroom Fettuccine Pasta Dinner! Keeping in the spirit of putting feta on every.thing… Let’s make some fettuccine with leek and mushrooms, and sprinkle it with feta cheese! However, and first, we need to discuss. At this present time, there’s a Farm Stand with a ton of corn in each corner of this state. Within a 10 mile radius, I can take you to at least 6 of ’em. A good week ago, I found myself standing in the kitchen, eating bread-crust smothered with Nutella and thinking about what to do with all the corn that I just bought from the corner’s farm-stand. Of course I threw most of the corn on the grill and enjoyed a deliciously juicy Grilled Corn with Herbed Butter, but still. That gets boring, and boring food is no good. So as I was sitting there stuffing my face at 6 in the morning, I decided to test the partnership that would involve corn, pasta and mushrooms. At 6 a.m.
My brain goes to all sorts of places when we decide to think about food. Literally, I can see the lights go on in my head, the disco balls turning, and my food-brain just getting out of control. In a good way, though! Not in a weird, she’s-lost-her-mind type of way. I figured that if corn is easily combined with orzo, then it should be just as delicious with fettuccine. And it was. Hooray! I know I’m not being completely revolutionary here – duh – buuuuuut this was damn good! I added all sort of goodies in here. However, the leek is the star. It definitely dominates. You can smell it, taste it, love it. It’s SO GOOD! 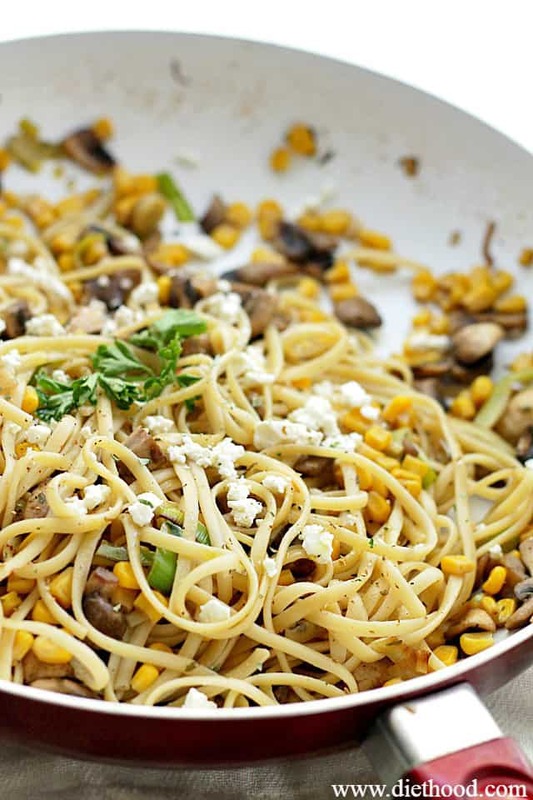 In trying to keep it light and meatless, I added a good dose of chopped mushrooms, and with just a sprinkle of feta, this pasta dish is now our new favorite. Until the next pasta dish that I make, and THAT will also be our new favorite. If you’re looking for something easy, quick, but incredibly good, make this asap. A super delicious, yet easy-to-make pasta dinner idea to add to your weekly recipe rotation! 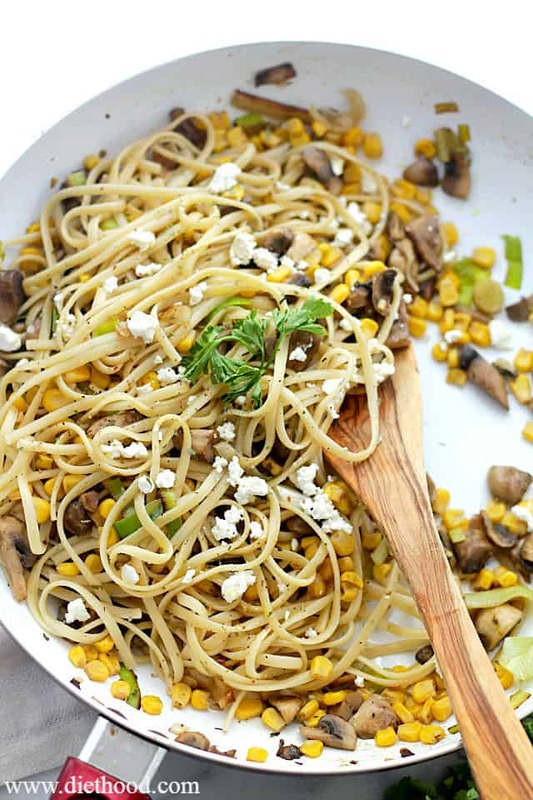 Try this Leek and Mushroom Fettuccine Pasta Dinner! In the meantime, heat butter in a large nonstick skillet. Add sliced leek, season with salt and cook until slightly tender, about 3 to 4 minutes. Add mushrooms and continue to cook for 4 minutes or until tender. Stir in corn, garlic, and seasonings; continue to cook for 5 minutes. Drain pasta and add it to the skillet. Add olive oil, toss to combine and continue to cook until heated through. Sprinkle with feta cheese, toss and serve. haha 😀 One of the best comments, EVER! High-Five!! Thank you, Meggan! This looks like the ultimate comforting pasta dish. Wishing I had a bowl in front of me right now to devour some… thanks for the great recipe! We LOVE fettuccine! The flavors here are fantastic! Pinned! 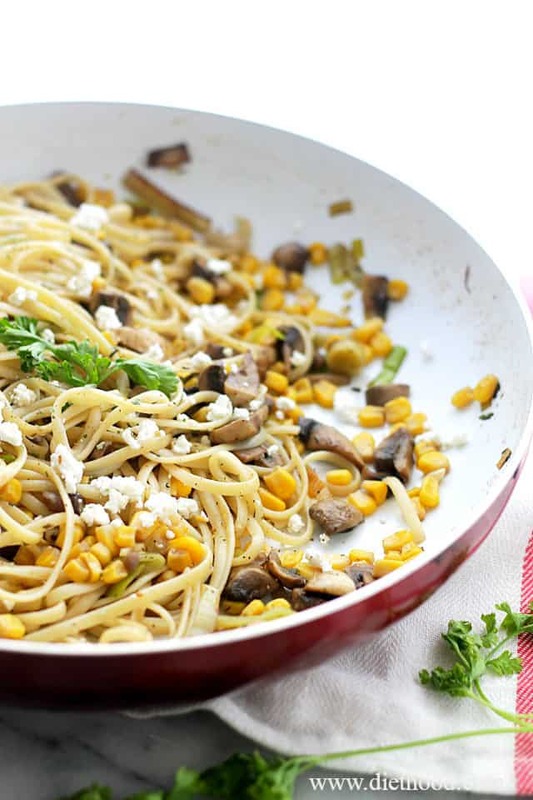 I absolutely LOVE that you added corn to this pasta dish. Not traditional but totally doable. Mmmm…I love corn and leeks with pasta. This dish looks so good. I love everything about it and can’t wait to try it out! This looks like the perfect pasta dish! 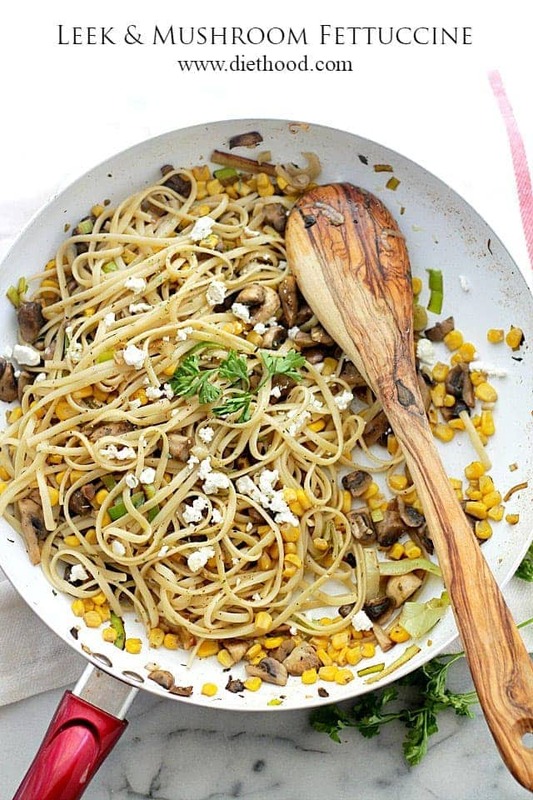 Love all the mushrooms and corn! 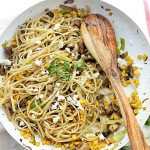 Yes please, love the mushrooms and feta!